Preamble. 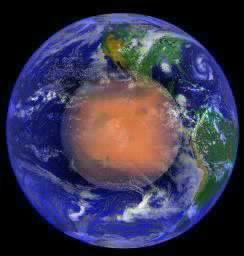 On 24th May 2001 Cydonia enthusiasts finally got a full (almost) overhead, high resolution image of the "Face". 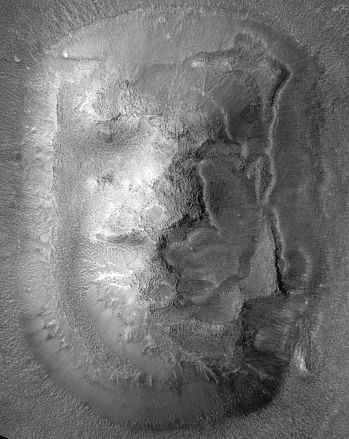 The image was published in response to a threat by the FACETS organisation that they would sue NASA if publicly made promises about the imaging of Cydonia anomalies were not honoured (click "stargate" for details µµµ). 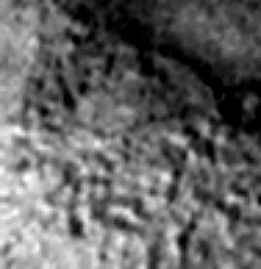 This, the first truly high resolution image of the "Face", was apparently held back from publication whilst NASA prepared a media campaign to ridicule any idea that this object might be artificial (µµµ). The success of this slick propaganda can be gauged by the prejudiced nature of the BBC report on the release of the image (µµµ). After reading other news agencies on the internet I realised that they and the BBC were probably quoting word-for-word from a NASA press release. (So much for investigative journalism). The three images below show the image in a much reduced form. Foreshortening effects are not a real problem compared to the 1998 image, but tend to work in favour of the eastern, "Lion" side of the "Face" at the expense of the "Ape-man" side. The first of the illustrations is a normal contrast enhanced version of the image. The second image has been processed using local equalisation. This is a rather brutal form of contrast adjustment that makes the image look like an old fashioned photostat. It is a useful way to bring out the salient features across the whole of an image. The third illustration in an "annotated" version of the image intended to high-light the large scale architectural looking features in the new image. These will be covered in exhaustive detail in Part Five of this study. They provide the most convincing visual evidence that the "Face" is artificial. General comments on the new image. The new "Face" image published on the MSSS website can be accessed by clicking the next "stargate" µµµ. Resolution at six feet is somewhat lower than the narrow image strip through the western side of the "Face" that was published in January 2001. The Sun direction and angle in both these two latest images is identical, i.e. from the West. In both the January and May images the features on the western ("Ape-man") side of the "Face" are very washed out by sunlight. This effect is increased by the fact that features such as the "mouth" run on an East/West axis, so the lie of the land casts no helpful shadows. 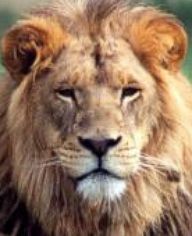 However the eastern, "Lion" side of the "Face" benefits from the shadow cast by the "Face's" high ground and viewing conditions here are much better. Many people are puzzled why the shape of the "mouth" in the MGS images never seems to match that in the Viking ones. I shall show later on that there is no discrepancy between the MGS and Viking "mouth" images - it's all down to a lack of low Sun shadow and not being able to "see the wood for the trees" at higher resolutions..
High ground features. 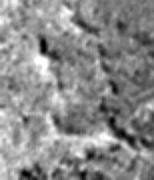 The biggest surprise of the May 2001 image is that the "nose" area that looked so pitted and honeycombed in the April 1998 image is actually very solid. I had been anticipating that this highest part of the "Face" would look similar to the cellular relief on the highest parts of the East Formation in the "City" (see East Formation image on right). It would seem that the dusty veil that enveloped the "Face" at that time meant that only the brightest parts really showed up well, giving an exaggerated sense of depth to low relief features. After closely examining the new image I've decided that the insignificant features that made up the "nostrils" in the 1998 image could not have been intended to be nostrils if the "Face" is a sculpture. It is also the case that we must abandon any notion of teeth in the "mouth" of the "Face" as seemed possible in the Viking images. However, what the artificiality hypothesis has "lost on the round-abouts it has gained on the swings" - and then some more - with the new image. If we return to what the highest parts of the "Face" actually look like then we find they consist of a rough terrain of building sized, eroded, rectangular blocks. Here and there, there are also narrow walls as shown in the illustration below, right. This example is taken just to the West of where we thought the "nostrils" were and it can be seen that they may be the remnants of something that was once more grid-like. 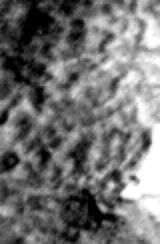 Its position is circled in dark blue on the "annotated" image of the "Face" above. As an example of the rough, block-like nature of the central high ground of the "Face" I've chosen not the "nose", but the area just below the "mouth". 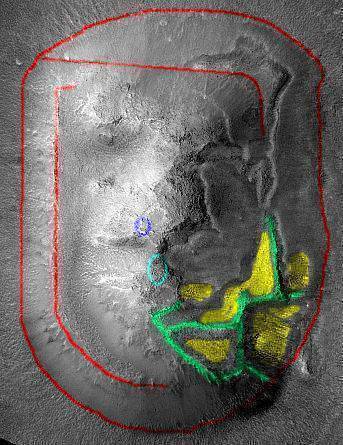 The sample area is circled in light blue in the "annotated" context image. This is shown below, left in an actual size enhanced GIF image. 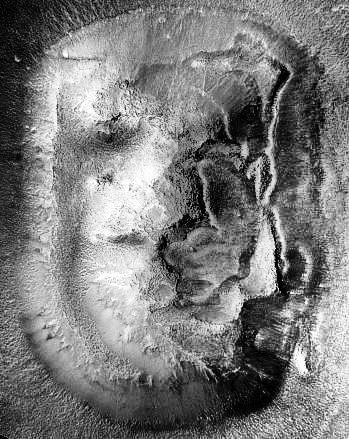 I've chosen this particular zone because of the interesting features at the top of the image where the "mouth" is pinched from top and bottom by two triangular shaped protuberances. As can be seen in the enlargement of this area the protuberance on the South side of the "mouth" has what appear to be structural engineering features. There is a substructure of narrow walls converging on the apex of the protuberance, and these in turn are criss-crossed by other narrow walls. It looks suspiciously like a "mars-crete" strut work, much like the internal ironwork that supports something like the Statue of Liberty. (See top part of enlargement. Enlargements are best viewed sitting well back from computer screen). A short word on the facial controversies. I've already commented extensively on Richard Hoagland's years old theory that the facial features of the "Face" are a morphed sculpture between an "Ape-man" and what Hoagland identifies as a "Lion", in Part Two (µµµ). So I will say very little about it here. 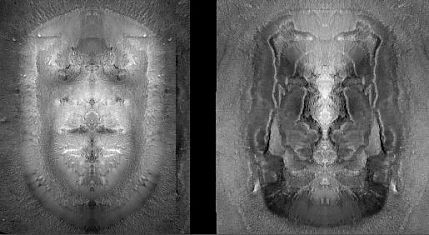 Needless to say splitting the "Face" down its dead centre and mirroring the two sides works as well with this image as with previous images - but as I've said previously, if there had been symmetrical facial features the artificiality argument would have been won by now. The display below compares a lion by the name of Charles with the Enterprise Mission's mirrored face images. What I will say about the facial features of the "Face" is that it seems a great co-incidence that their up/down alignment just happens to run parallel with the straight western edge of the "Face" platform. In other words the composition of the facial features in relation to the frame of the surrounding platform appears perfect. A second interesting co-incidence is that (when adjustments are made for foreshortening) the mirroring of the "Ape-man"/"Lion" faces works best when the "Face" is cut down its dead centre with a line (again) running directly parallel to the straight western edge of the "Face" platform. I suspect that one reason why many people are impressed when they look at the "Face" is that their subconscious mind recognises these facts. This page has become rather image intensive for quick downloading from the internet. To move on to Part Five of this study click the "stargate" below.